Before learning how to write the GMAT waiver letter, it is important to know what the GMAT is. First, it stands for Graduate Management Admission Test, which is a three and a half hour of the standard exam that is designed and made for the test takes that want to take up a Masters in Business Administration program. The score is an important aspect of the application used by business schools in determining whether an applicant meets their requirements in order for him or her to qualify for admissions. It is a lengthy exam that the business schools require from students, who should achieve high scores. In some case, students do not want to take the GMAT for reasons like those that don’t perform well in tests like it. If you want to apply to waive the requirement for a GMAT score, you will have to submit a GMAT waiver letter. 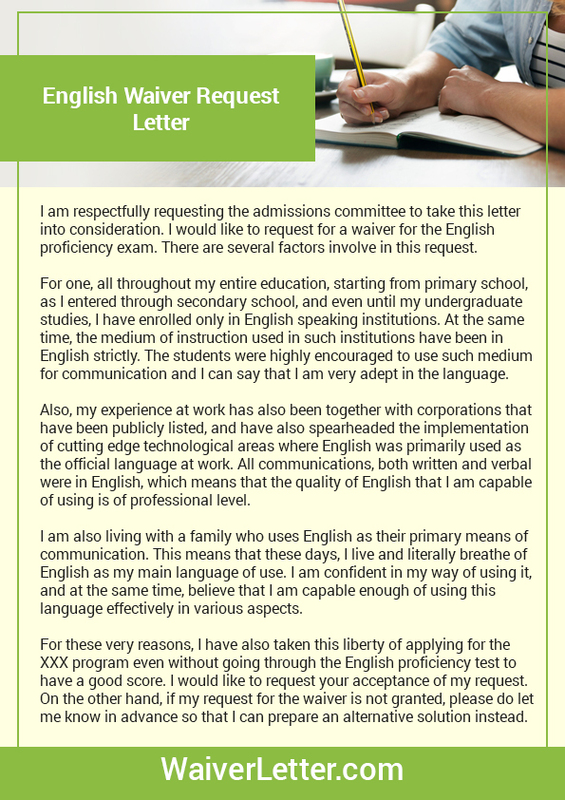 The sample of waiver letter does not have to be fancy or long, but it does have to be meaningful and clear. If you don’t want to take the test and submit a test score when applying for a business administration master program, then you have to be clear of the reasons you think you don’t need to submit it to the school. State the purpose of writing: Why are you writing the committee? State the reasons to apply for a waiver of the test: Mention and be specific of the reasons you think you don’t have to submit your score to qualify for the admissions. Some students state their business experience and other related reasons that they don’t need to submit a test score with the requirements. State your final appeal: Summarize your points and have a final appeal to have your request approved. In the closing sentences, let them know of your interest to receive an update on whether your request is granted or not. Also you may need some statement of purpose proofreading additionally. The main purpose of your letter is to demonstrate or let them know that your intellectual ability, experience and motivation are enough to qualify and that the GMAT is unnecessary for your application. 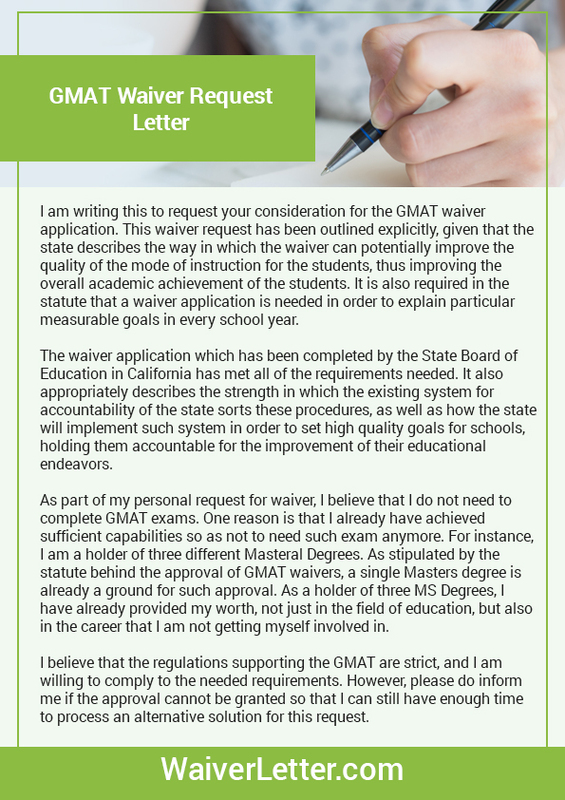 When reading, take note of the following sample GMAT waiver. 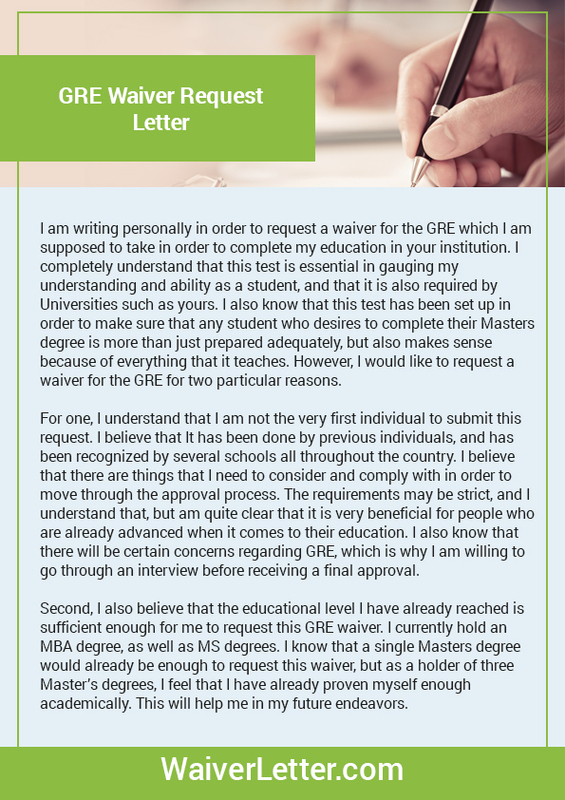 Use our GMAT waiver letter sample and follow the business or formal letter format when writing and avoid any fancy or casual style in writing the letter. Emphasize the reasons you don’t have to submit your GMAT score to qualify for the admission. You can do that by demonstrating your quantitative and analytical skills, which are essential for business administration processes and professional functions. Having read a good waiver sample, guess you understand that you also have to highlight your work performance to indicate that you already have enough knowledge and skills to do well in the program. Finally, provide specific examples to support your claims. There you have your guide on how to write the GMAT waiver, based on the best practices of a good writer of a GMAT waiver letter sample. Learn more about this test waiver and excel in your letter today! When you are done, you might want to discover how to craft an LSAT waiver as well. Start writing your GMAT waiver letter today!